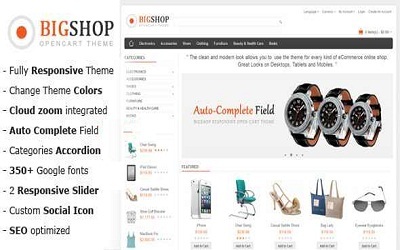 Bigshop is another multi purpose responsive theme for OpenCart script. Basically Open cart is the free e-commerce script that available in softaculous. Not only in softaculous, advance users will be install OpenCart script manually. If you install OpenCart script first time there are a free default theme that is not a responsive theme for SEO and other purpose. In the point, Bigshop is the fully responsive theme, colorful and changeable, SEO optimized and user friendly. Interested user can be purchase the theme from themeforest official website. Absolutely it’s not free there are &40 values. To purchase the theme visit our reference suggested link.